Lucy was first brought to the WECare team's attention back in March when a concerned local gave them a call. She was found with a huge open wound on her abdomen that had clearly been there for quite some time as all the tissue was dead. Upon closer examination they discovered that Lucy had sustained some pretty bad damage to both her back legs and her ears were crumbling away as the team touched them. Despite being in lots of pain, Lucy showed nothing but love and affection to all the WECarers. They tell me she was without a doubt the most well behaved patient they have ever had, which is incredible looking at the photos of her before treatment. Lucy underwent a few big operations. The first operation was on the abdomen, as all the tissue was dead, the vets had to debride the tissue (cut away at it) to encourage it to regrow and heal. This went amazingly well, but unfortunately Lucy’s next operations were a little more complicated. A couple of days in her Achilles tendons completely snapped- both of them. So their amazing volunteering vet, Dr. Ester, researched tirelessly on how to use a special graft to suture both tendon ends back together. The gap between both ends on one leg was an incredible 7cm long!! After hours or intensive surgery, the grafting went well and Lucy came round like a trooper. The recovery for this was the most important. Lucy had to be isolated in a small area so she couldn't move and was bandaged up with splints to keep her legs completely immobilised. Lucy's bandages had to stay on for 3 weeks before they could take a look to see if the operation on her legs was a success. The left hind leg was healing quite well but sadly the right one wasn’t. This was a massive disappointment to the WECare team, but they decided that Ester would try again. So the whole process was repeated and little Lucy was a star throughout it all. Thankfully the second time round was a success! At this point Lucy's abdomen had almost completely healed over and little patches of hair had even started to grow back! Eventually Lucy was taken out of isolation and was allowed to wonder around the office and clinic with the WECarers - which she loved, especially once the aircon was in place! Now Lucy is fully healed and happily trotting around the garden with all the other resident pooches. Lucy is a popular lady and has become particularly fond of WECare's newest pups, Benny and Buster. They can often been found rolling around playing together or curled up in a tyre sleeping. 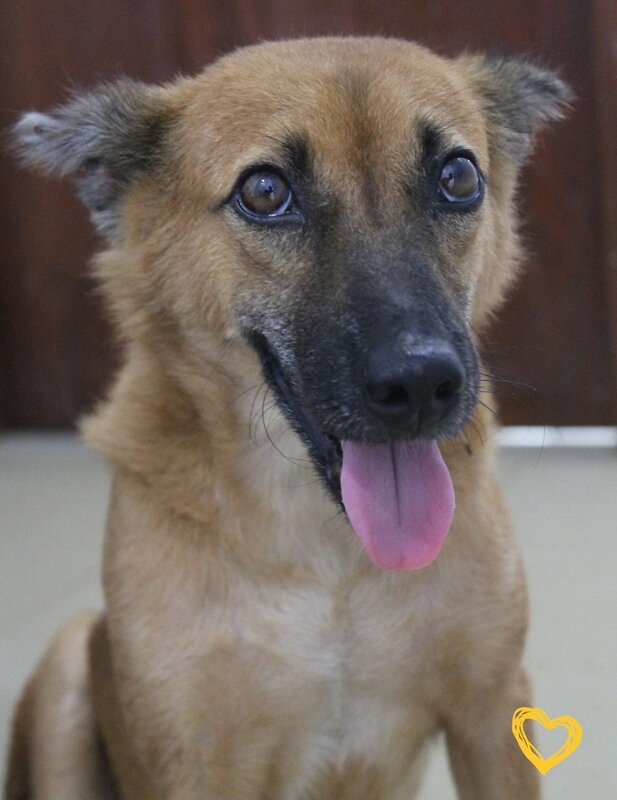 WECare are now in search of a safe and loving new home for Lucy to go to. After spending the best part of 5 months with them, they're all going to have a hard time saying goodbye to this lovely lady, and I can hardly blame them! For more information on WECare and the dogosaurs they have saved, check out their website or Facebook page. If you'd like to support their great work, why not join us on our next pack walk and put a few pennies in the collection box?